Creek of Great Britain, is well known for hi value audio gear. The OBH15 is a very good example. The OBH15 is a fully hybrid design featuring low noise and accurate equalization. The OBH-15 mk2 has a completely new circuit design, with a discrete transistor MC and integrated circuit MM stage. 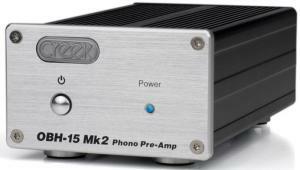 Unlike its predecessor, the new amp has multiple gain settings and matching capabilities for capacitance and resistance. The signal required by most modern amplifiers is described as being LINE level which is, in technical terms, between 200 and 500 milli-Volts sensitivity with a flat frequency response. The Creek OBH15 is easy to install. It can be placed anywhere and requires no attendance. It features a power switch and LED. The OBH15 is for Moving Magnet and Moving Coil Cartridges. There are separate inputs for each type cartridge with adustable loading for both. Dimensions 4 x 6.0 x 2.5"
The OBH15 incorporates hand selected transistors for the lowest noise performance. It is a very quiet phono preamp. Internal voltage regulation effectively isolates the power supply for quiet hum free performance at any volume level. The extruded enclosure shares a common "look" with other Creek products. The really great features to take note of with the OBH15 are, I believe, the sound quality. The discrete design lets the designer optimize the circuitry and the result is alot of detail in the soundstage and low noise. One of the biggest let downs with phono stages is noise and hum. Phono stages must be quiet at normal and above normal listening levels. The Creek OBH15 is very quiet. If this is your first "better" phono stage, you will hear lots more detail and clarity in your music. The OBH15 shares the KAB tradition of true single ended Polar Stable design. This technique operates the circuitry in a constant state of preconditioning(often called Burn In). This ensures a very consistent sound quality that never waivers.